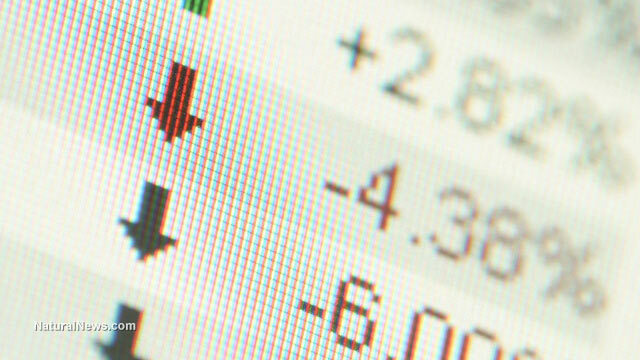 (NaturalNews) Stocks extended losses on Friday as the Dow Jones Industrial Average briefly plunged more than 500 points before rebounding somewhat, only to lose ground again. The session's steep decline – 3 percent of the index's value – comes amid chaotic market conditions around the world, turmoil that some analysts describe as fallout from an unexpected Chinese yuan devaluation last week. As noted by CNBC, the Dow's plunge and gain signaled a roller coaster day as the index dipped in and out of correction territory for the first time since 2011, as all blue-chip stocks lost ground. Over the last five years, the Dow has only experienced four instances with closing losses of more than 400 points. "For investors the momentum and the drive of the market is now lower (than) it used to be because there's no place to hide," said Lance Roberts, general partner at STA Wealth Management. "Every time we hit the major technical points we kept selling." Some traders noted that investors stopped looking at technical trends and rapidly selling off stocks. "It's an expiration day and it looks like they're to have for sale on the close maybe as much as a billion dollars," Art Cashin, director of floor trading for UBS, told CNBC. In interviews with the cable financial news network, some traders were unsure of just how far down the floor would go, suggesting that it might be a couple of days or even weeks before all of the damage could be tallied. Visit Collapse.news to continue reading the full article.